Outlining the practice and benefits of meditation and mindfulness in combination with the use of essential oils, Heather Dawn Godfrey explains how these practices hone and sustain a conscious awareness of “being” in the present moment, focusing attention on what you are sensually experiencing and leaving no space for regrets, traumas, fears, anxiety, or anticipation. Providing the latest scientific research on the restorative, rehabilitative, and psycho-emotional healing effects of essential oils, she explains how the sensory experience of odors can immediately draw your attention to the present moment, trigger a specific state of consciousness, such as a deeper meditative state, or offer a way to regain composure quickly when dealing with life’s ups and downs. She shows how many essential oils naturally reduce stress and anxiety, promote a peaceful attitude, support concentration, regulate breathing, and stimulate serotonin and GABA pathways in the brain, making them ideal aids to mindfulness and meditation. Explaining methods to incorporate essential oils into your practice, Godfrey introduces readers to the “Gem” essential oils--a group of oils specifically selected for attaining and maintaining a state of mindfulness, as well as a broad spectrum of therapeutic properties--and she provides an easy-to-follow chart to help you select the oil that is right for you. 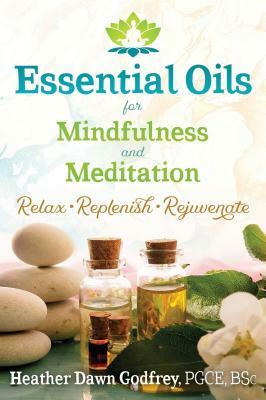 Offering a hands-on practical guide to integrating essential oils into mindful and meditative practice, the author shows how each of us has the ability to self-generate a calm, tranquil, and worry-free state of mind. Heather Dawn Godfrey, PGCE, BSc, is an aromatherapist, fellow of the International Federation of Aromatherapists, and an aromatherapy teacher. She has published a number of articles and research papers exploring the benefits of essential oils, such as how they can be applied in the management of ADHD. She lives in Lyme Regis, Dorset, UK. “There is a unique way to enhance psychological well-being waiting to be explored. This book tells you how meditation and aromatherapy, classic tools for modifying the mind, can work together to maintain a state of calm and insight. Familiar oils like rose and frankincense add serenity and inspiration to the practice of mindfulness meditation. Diffusing an essential oil during meditation practice can even return your awareness to that meditative mode if you smell the aromatic oil again later. — Sophie [Petit-Zeman] Olszowski, Ph.D., Director of SPZ Associates LTD.